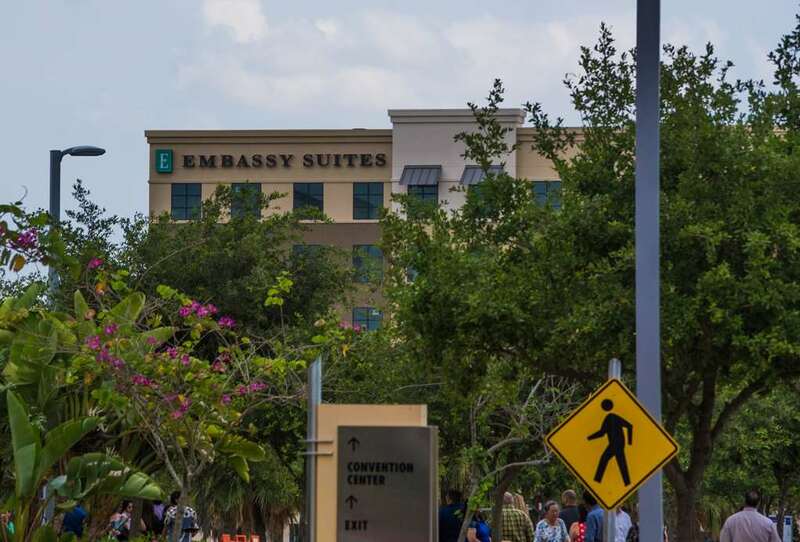 Welcome to Embassy Suites by Hilton McAllen Convention Center. Set just 3 miles from McAllen Airport 1 block from Palms Crossing shops and steps from the convention center our new McAllen TX hotel offers a stylish stay and a convenient location. Ask our friendly staff about our complimentary area and airport shuttle. Settle into a spacious two-room suite with modern decor. The living room has a sofa sleeper workspace and 55-inch HDTV plus a kitchenette with microwave mini-refrigerator and coffeemaker. The private bedroom has a king or two queen beds and an additional 55-inch HDTV. Enjoy complimentary WiFi in all suites and public areas of the hotel. Greet the day with Starbucks coffee and free made-to-order breakfast. Brickstone Grill serves delicious American favorites that can also be delivered to your door. Unwind with a cocktail in the bar after a convention and join us for our complimentary Evening Reception. * There*s plenty of outdoor seating for enjoying McAllen*s warm weather plus an outdoor pool. Get a full-body workout in the fitness center. We offer 12 000 sq. ft. of McAllen TX meeting space perfect for conferences and celebrations of up to 700 guests. Our event staff is happy to arrange on-site catering and A/V equipment options. Prepare for a board meeting in the 24-hour business center. *Service of alcohol subject to state and local laws. Must be of legal drinking age. Zoes Kitchen: Counter-serve chain offering Mediterranean soups salads sandwiches - kebabs in a colorful space. House Wine and Bistro: Quaint bistro with pastas large plates - more than 100 wines by the glass. Cowboy Chicken: Long-running counter-serve chain serving wood-fired rotisserie chicken tacos enchiladas - sides.